Thomas joined Watsi on June 15th, 2018. Ten months ago, Thomas became the 4088th member to automatically support a new Watsi patient every month. Since then, 1,004 more people have become monthly donors! Thomas' most recent donation traveled 8,700 miles to support Ebeneza, a toddler from Tanzania, to fund clubfoot repair. Thomas has funded healthcare for 13 patients in 6 countries. Damaris is a toddler from Kenya. She is an active three-year-old girl. She lives with her parents and three elder siblings. Damaris was born with an anorectal malformation, a congenital abnormality that leads to a complete or partial intestinal blockage. She needs to undergo a series of procedures to eliminate bowel dysfunction. Damaris is scheduled to undergo surgery to correct her condition on March 7. Our medical partner, African Mission Healthcare Foundation, is requesting $1,327 to cover the total cost of Damaris's procedure and care. After her recovery, Damaris will no longer experience bowel dysfunction or be at risk of developing health complications in the future. “I am glad I could get help from you,” says Damaris’s mother. Esther is a woman from Kenya. She is married and has four children. Her husband makes a living by making and repairing locks. After the delivery of her last child, Esther developed severe pain. She has visited several hospitals but has not gotten well. Finally, a scan revealed that she has cholelithiasis, or gallstones. If not treated, Esther may experience complications. Fortunately, she is scheduled to undergo surgery on September 25 to treat her condition. Now, she needs help raising $750 to fund treatment. She says, “I have a new born and another child that needs my care. I plead for help and hope my treatment will be successful. I can’t wait to see myself able to breastfeed my baby." Samnang is a young man from Cambodia. He has two brothers. He likes to watch TV and listen to rock music. Six months ago, he was in a motor vehicle accident that caused a fracture in his tibia, a fracture in his femur, and head trauma. He went to an emergency clinic, where they performed an ORIF procedure on his femur and his tibia. His left leg is still in pain, and he is not able to walk. 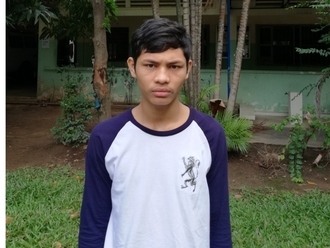 Samnang needs to undergo an osteotomy and bone graft procedure on his left tibia to help him walk again. Surgery is scheduled for September 4 and will cost $390. He says, "After surgery I hope my leg is better, I can walk normally, and have no leg pain."